Offered in partnership with Seattle Children's Theatre Drama School, Discoveries Day Camp (DDC) offers a blend of theatrical and environmental education for children ages 5-7. Registration is through Seattle Children's Theatre. Magizoology: It is a race against time to get our magical zoo ready for its grand opening. 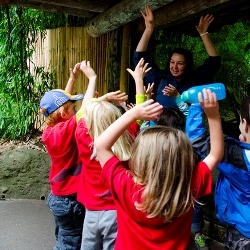 We learn how zoo staff care for real plants and animals. Then, using this knowledge, our magic zoology skills and a healthy dose of imagination, we will embark on adventures to feed dragons, keep disappearing creatures in their exhibits, and build a new home for a baby chimera. I Spy: Penguins in the savanna? Disappearing monkeys? There's something strange going on with the animals and it's up to our secret agents to solve the mystery. We travel around the world sorting things out as we learn about animal behavior. Use your detective skills to track down the culprit and restore order to the animal kingdom. When registering for Discoveries Day Camp, please search by camp code (Z01, Z02, etc.) or by camp name. If you have additional questions or need assistance, please contact Seattle Children's Theatre directly at 206.443.0807 ext 1186.